You can download a complete copy of a Pro Managed WordPress site anytime. You can also select specific files or folders to download instead of the complete site. Note: Pro accounts are available only in the United States and Canada. In your My Products page, next to Managed WordPres, click Manage All. 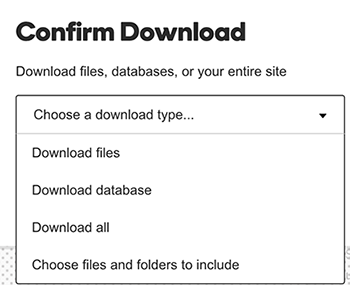 For the site you want to download, click the three-dot icon and select Settings. 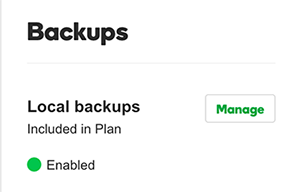 In the Backups section, click Manage. 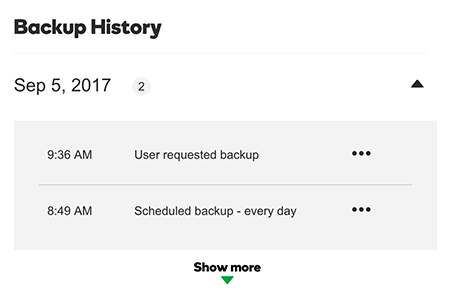 In the Backup History list, click the three-dot icon next to the backup you want to download, and then select Download. If necessary, click the triangle to expand the list of backups to find the one you want. Select Download files to select specific website files. Select Download database for just the site database. Select Download all to download the complete site. Select Choose files and folders to include to select specific files and complete folders. Click Start Download. We'll create a Zip file and send the file to your default downloads directory. When the download is done, you'll see a success message. Is there a way to download all the files for my hosted website?